In order to determine whether swagbucks is legit or scam, we need to first learn what it is all about. 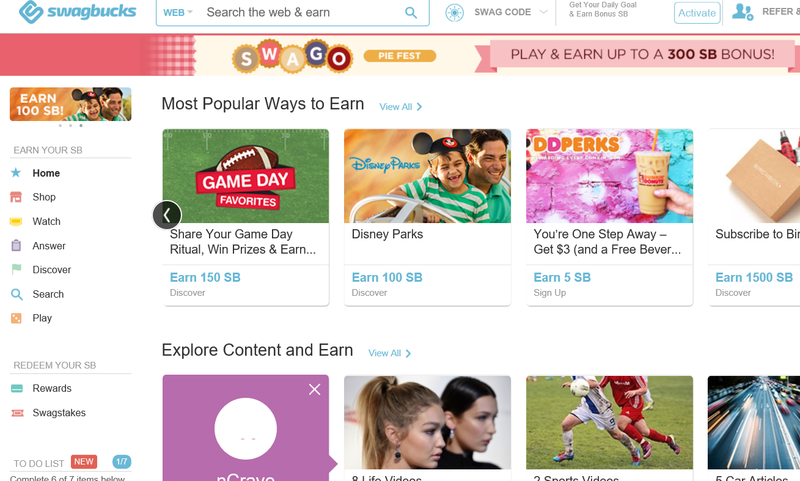 Swagbucks is a site where people earn money and/or gift cards by shopping on their favorite sites, watching videos, playing games, taking surveys and more. You get free gift cards doing things online by earning points called SB. The swagbucks reward store has more than 140 brands of gift cards to choose from including Walmart, Amazon and PayPal. Swagbucks have many interesting ways for members to earn. On their home page they display opportunities under categories like ‘most popular way to earn, explore content and earn, featured ways to earn, shop and earn, answer surveys and earn, discover special offers and earn, watch videos and earn and play games and earn’. You can select from each category the specific thing you want to do. Each item tells you how many points you will earn doing it. If it is a video, game or survey, it will tell you how long it will take you to complete it on average, and how many SB points you are going to gain. 100 SB points is equivalent to $1. You need 300 SB points to redeem a gift card worth $ 3; so 100 SB point for each $ 1 as with cash. It takes about 11minutes to make 100 SB points on a survey. It takes about an hour of video time to earn 3 SB points. You can earn up to 11 % cash back on purchases and 1 SB. It takes an average of about 11 minutes to make a $1 which means in an hour, you will make just about $6 or less. All the surveys that I took, lasted longer than the estimated time by at least 3 minutes (even on my fastest speed). Since some surveys ask for personal information including your email address, this results in spamming. You can be disqualified from a survey depending on your answers and loose all but 1 SB points of the promised amount. So, is Swagbucks legit or scam? In my opinion, swagbucks is legit not scam. With swagbucks, you can make money doing the things you already do which is great. However, if you are interested in making enough money to make a living, this may not be the best option for you. Someone looking to make money full time online should consider other options like affiliate marketing or eCommerce. If on the other hand, you are just looking for a side job to gather some loose change, taking surveys on swagbucks might be a good choice, since you do not have to spend money to make points. Nonetheless, there are limited surveys available and you can be disqualified from a survey for unclear reasons. This will further reduce the number of surveys you can generate money from. You can only spend so much online. Even with the cash rewards and all, you will hardly make enough for full-time income. Swagbucks is for people who only need an extra hundred dollar a month or two to cover certain expenses like phone bills. People looking to make fulltime income online should try another method. My # 1 recommendation for online marketing might be what you need. It is free to enroll and there are tons of lessons provided to help you succeed in you endeavor. Swagbucks is a legit online business where you can make money doing the things you already do online almost everyday like watching videos and taking surveys. It is a great way for people to make an extra $ 100 to cover small expenses. It is however not a good source for full-time income. If you are interested in generating full-time income online, read my post tilted senior work home jobs for ideas or join my # 1 recommendation for free. Please leave a comment about your experience with swagbucks.